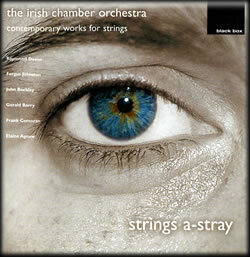 Gerhard Markson's extraordinary interpretation of the complete string orchestra version (1978) of Embers (1973) with the strings of the RTÉ National Symphony Orchestra of Ireland is included as the final track on the first CD of this album of extracts from the Composing the Island festival, issued by RTÉ Lyric FM. Embers is one of those tracks that cannot be individually downloaded from iTunes, but the whole album is well worth exploring. 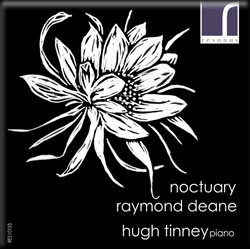 Making his Resonus debut, the prize-winning pianist Hugh Tinney presents a world premiere recording of the celebrated Irish composer Raymond Deane's cycle of night-pieces for piano,Noctuary. Composed in 2010-11, and recorded in the composer's 60th birthday year, Noctuary takes influence from the Cereus drawings by the artist Renate Debrun that feature in the album's artwork and booklet. Featuring two books of six movements each, Noctuarypresents a varied, vivid and atmospheric representation of the dead of night. A major contributor to Irish concert life in the last thirty years as well as perforing with many great orchestras throughout the world, Hugh Tinney performs Noctuary with panache and dedication, creating a dramatically lucid and eloquent nocturnal sound world. 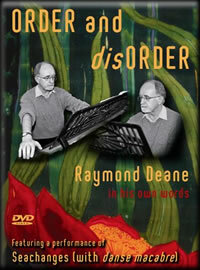 Order and disOrder includes a performance of Seachanges (with danse macabre) by the Jane O'Leary-directed Concorde ensemble in which the piece is explored by the composer in depth and discussed in the context of his Macabre trilogy. The 183-minute-long DVD also provides a detailed biographical look at Deane's childhood, schooling, musical career and involvement in campaigns supporting Human Rights. A more concentrated section looks at his approach to composing and includes excerpts from Ripieno, Samara, Dekatriad and Linos I, as well as offering an overview of his choral and operatic works. biographical look at Deane's childhood etc. etc. 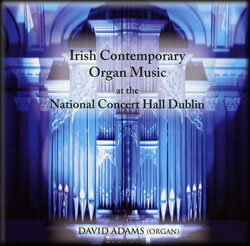 A diverse collection of contemporary Irish works for organ performed by David Adams. 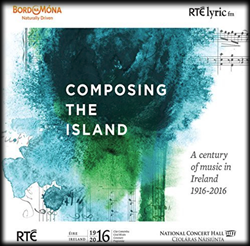 Featuring a broad range of Irish composers including Dennehy, Volans, Buckley, Deane, McLachlan, Barry, O’Connell and Godfrey, the CD is the first album of new Irish organ music and also the début CD recording of the National Concert Hall’s organ. 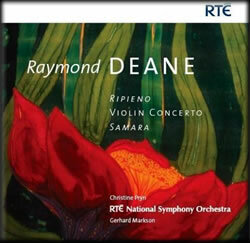 The three orchestral works on this disc by Raymond Deane, ‘Ripieno’, Violin Concerto and ‘Samara’, were commissioned by RTÉ and premiered by the RTÉ National Symphony Orchestra between 2000 and 2005. 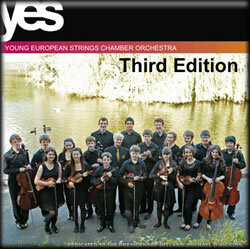 The composer says that the works, "encapsulate most of what I have learned about composition in my lifetime - so far." 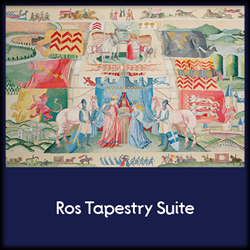 One of Ireland's leading composers, Raymond Deane, is here represented by three re-interpretations of the traditional concerto. Quaternion explores different relationships of keyboard and orchestra, Krespel's Concerto is based on a tale of Hoffmann and the Oboe Concerto dramatises the soloist as an exiled outsider. The Irish Chamber Orchestra, led by Fionnuala Hunt, perform 6 works written for them by Irish composers (with Kenneth Edge as saxophone soloist). 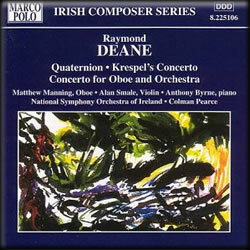 The first work on the album is Raymond Deane's colourful 'Dekatriad' (1995). Solo piano-pieces played by Hugh Tinney, the 2nd String Quartet ("Brown Studies") played by its dedicatees the Vanbrugh Quartet, and the "Macabre Trilogy" ('Marche oubliée', 'Catacombs', 'Seachanges [with danse macabre]') played by The Schubert Ensemble of London and the ensemble Reservoir, conducted by Mikel Toms. 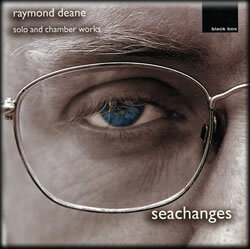 This album provides a kaleidoscope of Deane's piano and chamber music.